If you are a regular reader of our blog, it won’t come as much of a surprise when I say I was a big fan of the Ryzen launch last year. This was because it gave me (and many other builders) not only a cheap high-core count CPU, but it also made Intel change their schedule and up their game. By the time the 2nd-generation Ryzen launch came around, however, I was already using a shiny new i7-8700K build (thanks to funding from my university). So I feel ready to tackle the job of checking in on the current state of the Ryzen 5 vs Intel i5 war! We are approaching this fight here primarily from a pricing standpoint. With the R5 2600 and R5 2600X coming in at $199 and $229 respectively, they are right in the ballpark for the (also quite new) i5-8600 at $225. Because this particular i5 isn’t able to be overclocked, there is a very obvious difference straight off the bat for AMD’s offerings, and the question becomes: do you save a little on the R5 2600 and overclock it yourself, or spend more on the 2600X and let AMD hardware do all the work? So before we break things down too much, let’s take a look at a straight comparison chart of specifications. This is the first category where you can start to split the processors up a little bit. From all the multi-core and single-core benchmarks available, Intel still has the edge on single-core performance; but it’s a lot closer than with the previous-generation Ryzen CPUs. That being said, Intel simply cannot keep pace when it comes to multi-core, thanks to the extra threads on the Ryzen options. Although the difference from having these extra threads is not as substantial as having extra cores, they do make a difference. If you want to read more about SMT and hyper-threading, you can do so with my tech article here. This is why, in a number of synthetic tests, you’ll (rightfully) see Ryzen run ahead as much at 33% thanks to those extra threads. Sample benchmark in Blender from GamersNexus review. That SMT difference though is only really shown in software that can take advantage of it. One of the things I’ve noticed on my new i7-8700K build is that, although it has less cores and threads than the previous-generation R7 1700X, the i7-8700K still performs faster in Adobe Premiere Pro because that software still leans more on single-core performance. That being said, it’s so close that you’re typically not going to feel the difference. When you drop down into the i5 range, that shift goes the other way, with AMD offerings running a touch ahead for multi-tasking where programs can utilize the extra threads. For gaming, it’s a toss-up again. 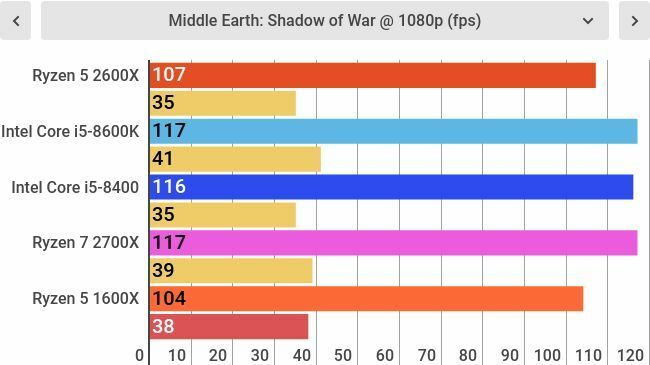 For games that can take advantage of all the threads, there is literally a few frames (usually less than 5-10 fps) difference. However, there are still not that many games that can do so—and even then, Intel’s single-core performance still has it ahead in most games. This one is sort of a tie, or a slight AMD win for content creation (program depending), and a slight Intel win for gaming. As most users seeking performance stats on this site are gamers, we would give the slightest edge here to Intel. So the one CPU that you may be wondering about, but which I didn’t put in the chart above, is the i5-8600K. This is because, although getting the 8600K would mean being able to overclock, its price is over $50 more than the R5 2600. As both the AMD and Intel offerings run hot when overclocking, that $50 goes a long way towards decent cooling. Furthermore, if you’re going off the various stock performance benchmarks, AMD are still better for providing a very good new cooler in the box, be it the Wraith Stealth or Spire models, further driving down overall costs. Up until very recently, there weren’t any cheap motherboards for the 8th generation either, yet manufacturers are improving that thankfully! The other thing related to CPU cost is actually RAM. With 1st-generation Ryzen, they had a huge uptick in performance with high-speed RAM. With 2nd-generation Ryzen+, although they can get much higher speeds on the new motherboards, it seems that Ryzen performance is much more linked into both the CPU overclock and RAM speed, allowing more of a balance between the two. As such, you can feel more comfortable that—whichever RAM you purchase—you’ll get a similar performance with both AMD and Intel. AMD; although it is quite close, because of the cheaper cost and the included cooler, Ryzen+ wins this round. The reason we used the two categories above is that, in truth, Intel and AMD are very close. Although many will want an outright winner, this outcome is actually the better option for us all. This is because it’s close enough to drive competition between the two manufacturers, driving down costs while bringing up performance per dollar. For content creation (streaming, rendering etc.) AMD is still the better option, thanks to the extra threads and cheaper costs, yet if maximum performance for gaming is a requirement, then Intel is still the go-to option. But what do you think about the ongoing CPU wars? Are you an Intel fan or an AMD fan, and have you built with any of these new CPUs recently? Let us know!